Thanks for hosting me Fay! You are very welcome, Pamela. Thank you for sharing. What wonderful holiday reading! Pam, I know you are an excellent writer. Congrats on continuing to write worthy literature. 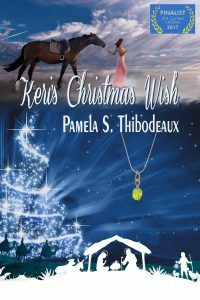 Loved the vignette about generosity of co-worker who was “paying it forward.” Keri’s Christmas Wish sounds compelling and timely. Have a blessed holiday! Oh, Pam, what a lovely story! Perfect for Christmas. It brought me to tears. Thanks so much for sharing. What a beautiful story of generosity! May we all live like that, finding ways to be generous when we can so we can bless others! When we were first married, someone we didn’t know from church gave us a check. Her generosity inspires us now, as we decide how much to give young couples. Perhaps that’s why this story struck such a chord with me. I love stories of God’s provision, and stories of generosity that starts a chain of blessings! This story sounds so wonderful! A beautiful way to enjoy the season. Thank you for sharing! Thanks for sharing, but then it is the sharing time of year. Thanks for sharing. Many years ago, my husband had surgery and couldn’t work. Someone gifted us and I was hesitant to accept. She reminded me that we can’t be givers unless people are willing to be receivers. Both are blessed. I’ve been both, and it sounds like you have to. Thank you for sharing, Pam. It reminds me of what happened after my husband fell off the roof and crushed both heels. He worked for straight commission and was unable to walk for several months. For some reason, the Lord had him move the TV set, and he found a check he’d never cashed. We had groceries and we had something for the kids for Christmas. God is good all the time. What a wonderful story! Gave me goosies! Beautiful story, Pam. Enjoyed reading it. Sorry I’m late responding – another crazy/busy Medicare AEP day and still babying my arm (per instructions from massage therapist) – I hate taking medicine and I want this pain GONE LOL! Thank you ALL so very much for your love and support! Good luck and God’s blessings to Each and Every One of YOU! We never know who God is going to use to bless us. What a heart-tugging story. May we always be sensitive to the Spirit’s leading. Keri's Christmas Wish sounds like an amazing tale. May your Christmas be blessed and your New Year be prosperous. Fay, as usual, Inner Source is lovely. Merry Christmas to you as well, my friend. Lovely story, Pam. Best wishes.